Golden Home Inspection: Golden Home Inspections For Professional Assistance - Home Inspection In Mississauga! 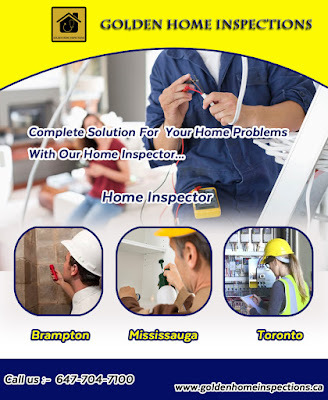 Golden Home Inspections For Professional Assistance - Home Inspection In Mississauga! Whether you’re buying or selling a home, you need a home inspection to get a clear idea of its value and any potentially serious issues with the home. A Home Inspector Mississauga can help you get proper information about your home or property. * Are you planning to put your house on the market? * Do you want to sell it faster? * Would you like a top dollar? * Are you interested in reducing negotiating time? * Do you want to protect yourself from potential liabilities? For these and other reasons, a home inspection is a prudent first step in the process of selling your home. You, as the seller, must present the most saleable property possible. A home inspection report will reveal the current condition of your house with specific evaluations of more than 400 items and guide you toward enhancing the value and marketability of your property. Most problems in a house are minor and can be rectified easily and inexpensively: chipped paint, doors or windows that stick, an air conditioner that wheezes, a filter that is dirty, etc. Such shortcomings are overlooked by sellers who have lived with them for years, but they are focused on by buyers. If the perceived problems do not derail the sale, they nevertheless provide grounds for price negotiation. Not only does the pre-sale inspection enable you to attend to problems before the house is put on the market, it also removes any questions—for you and home buyers—about the condition of your home. Buyers are positively influenced by a professionally produced home inspector report, which improves the speed, price, and likelihood of a sale. Some home sellers elect not to correct every defect reflected in the inspection report. Instead, they acknowledge the defects to buyers and explain that the asking price has been adjusted to reflect the estimated cost of repairs. Such candor tends to shorten negotiation time because buyers have fewer objections that could thwart a sale. In addition to facilitating the sale of a home, an inspection helps the homeowner comply with full disclosure real estate laws that are being enacted by more and more provinces. By focusing on the condition of your property, you are less likely to overlook a defect or material fact for which you later could be held liable. Whether you’re buying or selling a home, you need a professional home inspection to get a clear idea of its value and any potentially serious issues with the home. A Mississauga Home Inspector can help you get proper information about your home or property.